Reflections on Writing Every Day. I made a commitment to write over the summer. Every day. I committed to write or revise a chapter of a book that I started a few years ago. Every day. Here are some of the things that I am learning as I live with this commitment. It's hard. I know that doesn't surprise all of you. It reminds me of exercising, though. Some days are easier than others. Some days my knees don't hurt when I walk or it takes less time to work out the kinks in my forehands. Writing is like this, too. Some days it flows and my fingers can hardly keep up with my brain and other days, I hit the delete key more times than I hit the rest of the letters on the keyboard. Picturing myself, and announcing myself as a writer has helped me to maintain the commitment to write. This summer, I told my friends and family that I am writing a book. I even announced it on this blog. There's a lot of pressure when you announce this. It's sort of like training for a marathon. People ask how it's going and what it's about. Some even ask if they can read it. (I've said yes to only a couple...) I have found that this sort of checking in is really motivating. There's an accountability that I feel and it has helped me stay with my writing, especially when the process has gotten hard or when the delete button has been overused. Being a part of a writing community has been essential to my progress. We established a web-based writing community and every Sunday night for the last four weeks, I have met up with Catherine, Julie, and Stacey for an hour via google hangout. In between Sundays, we have all posted our work, opening our writing up to questions, feedback, comments, and compliments in shared google drive documents. We have shared links, contacts, tweets, articles, and opportunities, as well as our expertise as writers and teachers of writing. Just as exercising is easier for me in a group setting works better,--I'd much rather walk with someone than alone or take a fitness class than do individual machines-- writing with this group has helped me keep going. More importantly, writing together has helped me to fix mistakes, address important questions, and engage in meaningful revision. I finished my first draft two days ago, and have started the hard work of going back through it, seeing where readers lose interest, trying to answer the hard questions that Lisa Cron poses in her book Wired for Story, a book that I recommend for any aspiring writers! It's Monday! Here's What I'm Reading! I ordered I Kill the Mockingbird by Paul Acampora because To Kill a Mockingbird is one of my favorite all time books and I was fascinated to see how someone would spin this classic. As it turned out, it's not really a spin on TKAM, but more of an endorsement of it. Three clever middle schoolers launch a plot to increase the interest in TKAM. Their theory is that if they make the book more inaccessible, the perceived value would increase. Their plan spins out of control via social media and the press, and there were definitely moments when I wanted to jump into the pages and ask them what on earth they were going to do next in order to keep themselves out of some serious trouble. Woven into the text are some not so subtle messages about bookstores, readers, curriculum, and literature. I'd be interested to hear how a middle school reader would interpret them. I'm not sure that reluctant readers would enjoy this book, but strong readers will appreciate the layers of conflicts, and may even be inspired to pick up some the classics that are referenced, including To Kill a Mockingbird. What an adorable picture book The Adventures of Beekle: the Unimaginary Friend by Dan Santat is! This book could be a great read aloud at the beginning of the school year, as the central conflict has to do with the struggle to find a friend. Beekle waits and waits to be claimed as a friend, but finally sets off on his own, struggling to connect with anyone and to find his special person. Reading this book could lead to some important discussions about how we decide who to become friends with, as well as the potential pitfalls of having just one person. Discussions could also happen about inclusion, kindness, and empathy because of some of the pages and pictures within this one. Enjoy! Define "Normal" by Julie Anne Peters is not a new release, but it was on my daughter's summer reading list. I started it with her, reading it out loud. She had just come home from camp, so she went to bed early, and I finished the book. As a further endorsement, my daughter, who is not an avid reader, finished it also this morning before we did anything else. While there are some discussion questions listed in the back of the book, we did not need them in order to engage in a pretty deep conversation about the messages and the characters within this story. Antonia and Jazz are two strong middle school girls who provide significant and complex evidence that things aren't always what they seem. If you have missed this book, I strongly recommend it, and if you have forgotten about it, it is a wonderful book for reluctant readers, girls and boys. My second daughter is about to start her junior year in high school, and, since several of the colleges are far away, we are in the middle of an early road trip as I write. The slices have piled up, and I have wrestled with what to write, but, in keeping with the academic nature of the blog, I have chosen the most academically related one. On the back of every toilet stall that I used was information about drinking and instructions in case anyone has alcohol poisoning. The classroom that we were proudly shown was a lecture hall with about fifty very comfortable chairs that were immobile other than the swiveling action. These chairs were positioned on levels to face the front podium. Our tour guide proudly told us about his relationships with professors. One was based on how his professor helps him to use mathematical formulas correctly, and the other was about how he and his professor love to talk about and analyze the latest X-Box games. He also told us about the food, the dorms, the extra-curricular activities, the various traditions, parties and celebrations, the sporting events, and the conversations with his professors about professional athletes. Julia and I went to the town to have lunch and one of the two people I know who goes there was waitressing at an Irish pub, so we had lunch there. It was a forgettable meal, although I was happy to see our friend. "It's not the best food, really," she said as I paid. "Mostly, it's a drinking place." I told my daughter that I am working hard at not making judgements, since I do want the decision to be hers. I'm actually really interested in watching her process information, tours, cultures, and climates of various places. I've reminded her that it's summer, so it's very different than when school is in session, and she should keep that lens on when envisioning herself at any of these places. However, I will make a couple of judgements in the safe environment of my TWT community--Julia should really read my blog! Where's the excitement about learning???? What is the college experience about? For $250,000, we will get more than safe drinking environments and knowledge about how to work mathematical formulas, right? I know that the answers to these questions are probably more what I want them to be at this particular school, that what came across yesterday, and I do think that this university does great things and involves students in powerful learning opportunities. However, if Julia does end up choosing between this school and others, I will be looking hard at how and what kind of learning is valued! Off to see more! Happy slicing! I've been listening to the Catcher in the Rye by J.D. Salinger, as it's on my daughter's summer reading list and we are on a lengthy college road trip. One of the things that Holden says at the beginning of this classic is that when you read a really good book, you want to meet the author and really hang out with him/her. I agree, and I would love to hang out with Megan Jean Sovern who wrote the Meaning of Maggie. If I could have a conversation with Holden, I would suggest to him some additional ways to judge a book. I love when I care about the characters. I finished the Meaning of Maggie on Tuesday and I really miss Maggie. I miss her quirkiness, her humor, her commitment to learning, her analysis of her sisters, her sense of unfairness... I even miss her sisters and their vanity and quick tongues with Maggie. I would also suggest to Holden that really good books demand that you read them out loud or at least share parts of them. I found myself begging anyone who was in the room around me to "just listen to this one part." I've left the book on a nightstand so that my number one reading daughter will join me as a Maggie reader. Suffice it to say the Maggie is a wonderful first person narrator. Loved, loved, loved this one. Our Summer Writing Academy is only one week long, but is packed full of writing and learning for both teachers and students. Last week, I wrote about some of the activities that we did with the students throughout the week in Part 1. This was my second year of running it, and I worked hard to have the learning be impactful for teachers, as well as for students. This post has more to do with the reflections, insights and learning that we had as teachers. Each day, we met after the students left and exchanged ideas for a half hour. The conversations were unstructured and organic, led by a talented five-some of writing teachers. This year, we focused our students on narrative writing, but with a more imaginative twist than most get within our academic year's curriculum. For example, many of the students developed their main characters as animals, a la Poppleton, Frog and Toad, or the Lighthouse Family. I saw several stories with mermaids and princesses. (Yes, there are many more girls than boys who opt into a summer writing camp!) Other students had characters and action figures come to life. One of the goals for this summer was to have students complete at least one story that could be entered into the state writing contest, and this goal became the topic of conversation and debate for the teachers after the last session. Did the pressure of completing a piece motivate students? Did the product become more important than the process? Could students have learned better/more deeply if they had been working on parts of stories each day, rather than trying work through one story each day? As a group, we value process for these students and without planning to, we found ourselves planning for next year's writing academy. The teachers all loved Gail Carson Levine's Writing Magic, and if you have not read it, I highly recommend it as summer reading! Our proposed theme for next year? Learning from the magic of the masters to develop our writing toolkits. Each day we could have author studies, focusing on their expertise on certain aspects of story telling. And so, next year is evolving into developing a magical writing toolkit by studying the masters. No, we may not complete pieces, but we will send students of all levels off with tools and skills that will help them in all writing genres throughout the year! Bring on Summer Writing Academy 2015! watching one of my husband's friends sweat his way through his first hot yoga class. (My husband won't go.) At one point I'm sure that his eyelashes were sweating when I looked over at him. Having to hear about (and not see for myself) the six-foot shark that the morning beach walking crew saw on the beach on the ONE morning that I opted out of the daily walk. The shark was alive and managed to get back into the water! But the winner for the week's slice of life, the one that may one day end up as a children's book, has to do with the duckling that my husband brought home from his golf outing. (Plot spoiler: this slice of life is sad.) Despite my advice against naming the tiny bird, he was dubbed Waddle. At first I only saw pictures of the little guy, because I have been mostly staying at the beach. Garth found the duckling on the third hole, and my husband, softy that he is, carted Waddle in the basket of his pull-cart for the remaining fifteen holes, not knowing what else to do with a softball sized lost bird. Garth did everything right for this little duck. He called the nature center and was told that if he could find a family of ducks with young about the same size as Waddle, he could slip Waddle right in. The mother could be momentarily confused, but the nature center expert reassured Garth that the family would adopt his duckling. Garth drove all over searching ponds for ducks with families. July is not the usual time for ducklings to hatch. Foiled in his quest, he found a place to adopt Waddle, but the duck adoption agency was only open on weekdays. So Garth brought Waddle to our Rhode Island house, planning to take the duckling to his new home on Monday morning. Having once hatched ducklings, I know how much work they are and I wasn't on board for keeping Waddle, but he really was a cute little guy and I SO wish that he could have made it to a place where he could have become a full-grown mallard. As my daughter tweeted, rest in peace Waddle. 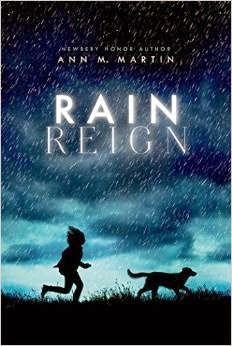 Rain Reign by Ann M. Martin will be on shelves on October 7th, but I had to share about it now because it was such a good read! Rose Howard is a 5th grader who is obsessed with homonyms, prime numbers, and rules. She lives with her father and has a close relationship with her uncle. Her mother is not in the picture and her father tells Rose that she walked out on them when she was little. She has a dog named Rain (of course she chose a name that is a homonym) that her father found and brought home one day. Rose adores Rain and they are always together when she isn't in school. Rose has Aspergers and has multiple challenges at school socially and academically. The story is told from Rose's point of view, which makes her character come alive for the reader. This story is full of suspense, heartbreak, and surprises. 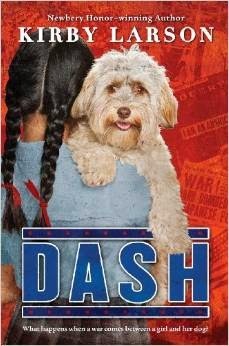 Dash by Kirby Larson will be published on August 26th so mark your calendars! I just started reading the ARC last night and could not put it down! I am always on the look-out for new historical fiction titles and I can not wait to share this one with my fifth graders - may have to be a read-aloud! This story takes place during WWII when people of Japanese descent are forced into internment camps after the attack on Pearl Harbor. Mitsi-Kashino, the main character, is in fifth grade and is a Japanese-American who lives in Seattle. She has a dog named Dash who she treasures! Up until the attack on Pearl Harbor, she has two close friends at school, but then they stop talking to her and make her feel like an outsider. Following the attack, her family is forced to move to a relocation camp and she can not bring Dash, which completely devastates her. A neighbor agrees to take care of Dash and write letters to Mitsi so she can stay connected with Dash. This is a must-read historical fiction book that shows the impact the bombing of Pearl Harbor had on Japanese American families. I love the time that summer offers for reading. This summer, I have been working on a chapter book, so my reading choices have been ones that have been serving as mentors. Patricia MacLachlan remains my favorite writer because of the simple language that contains complex information and meanings. Cynthia Rylant is another favorite for the humor and voice that she weaves into her writing. I re-read The Truth of Me by Patricia MacLachlan. Although it is a first-person narrative, I was studying it for character complexity. If you have missed this book, it's a more recent one from Patricia MacLachlan, with a characteristic artist, a charismatic pet, an an eccentric older person. I highly recommend it! I also picked up Patricia MacLachlan's The Boxcar Children Beginning. This book is a prelude to the classic series created by Gertrude Chandler Warner, imagining the events that led to the four Alden children living in a boxcar. While my chapter book is not a precursor to any famous series, (that's way too original and creative idea for me to have thought up) the character development and the sense of impending doom intrigued me as a writer reading this relatively short chapter book. 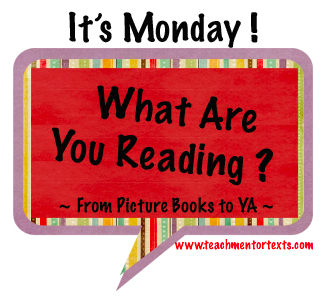 I spent time re-reading The Turtle from The Lighthouse Family by Cynthia Rylant. In this book, even though it is imaginative fiction, I used it to study how one event drives the story forward. I loved the relationships that were evident throughout this, and may go back to study how Cynthia Rylant includes snippets of information to inform readers about important prior events in the characters' lives. Not so much for mentor-me reading, I finally got to Prisoner B-3087 by Ruth Gruener, Jack Gruener, and Alan Gratz. Melanie Swider's class chose it as their book of the year, and I can see why, since this book is a painfully gripping, and disturbing account of a young man's will to survive the atrocities of persecution, abuse, and torture in concentration camps. Based on the true events of Jack Gruener's life, Prisoner B-3087 provides a lens into some of the most despicable behavior of humans, and could inspire students to want to learn more about an era that should never, ever be repeated. Currently, I am reading The Meaning of Maggie by Megan Jean Sovern. I am admiring the voice, humor, insight, and determination of the main character and narrator. I am sure that I will have more to say about it next week--thank you to all of the bloggers who have been raving about this one--I'm so glad I ordered it! Because I am writing a lot, my professional reading has suffered. Stay tuned for next week, as this is a goal for the week! Slice of Life is hosted by the inspiring community of twowritingteachers.wordpress.com. Everyone is welcome to read, post, and comment every Tuesday. Feel free to stop over and join us! Summer offers so much more time and such a different pace of life in my world. We are incredibly lucky to have inherited a house near the ocean and we spend our days beaching, boating, clamming, fishing, gaming, cooking... rarely paying attention to time or schedules unless they involve tides. That being said, 8:30 on Sunday night anchored me, as that was the time for my first google hangout with the new writing community that emerged from a series of tweets on a Two Writing Teachers twitterchat a few weeks ago. Thanks to the vision, knowledge, and perseverance of several people, I met up, via my computer and google, with Stacey, Catherine, and Julie, and we have officially established a writing group. This writing group has already inspired my writing life, and I feel more serious as a writer than I have ever felt. I have woken up in the morning with a strong sense of purpose and a list of writing tasks, for both my own work and the work of others, since we are all sharing pieces via google docs. The chapter book that I have written sporadically and episodically over the last four years is beginning to congeal, as I said, OUT LOUD, that I am going to complete a chapter each day, with my goal being to complete the draft, beginning to end by the end of summer vacation. Saying this to people in a video chat emboldened me to share my writing goals and vision with the people in my home. I realize that now I'm announcing it to a whole additional group of people. What strikes me is how when we take the work that we are doing seriously, others take it seriously as well, and we move away from the recreational puttering, a term that has most aptly described my writing life until now. My family and friends now know that a chunk of my day needs to include not only the beach, but also time to write a chapter, and they provide and protect my time. 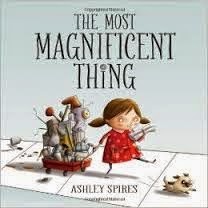 The Most Magnificent Thing by Ashley Spires is a perfect picture book to read aloud to discuss the concept of having a growth mindset vs. a fixed mindset. In this story, a little girl is trying to create something magnificent, but continues to struggle. She gets frustrated and even walks away, but ends up going back to her project to attempt it again and again. This text shows and reminds the reader that ideas we have in our minds or projects we attempt to do successfully, won't always go the way we want them to go. However, it is important that we continue to try and not give up on our dreams, plans, and goals. This is a perfect book to read aloud at the beginning of the year when introducing the concept of having a growth mindset and what it means to persevere. I can easily see this book being a mentor text throughout the year, being revisited again to discuss the power of mindset. Each summer, our district runs a week-long writing camp for students entering second through sixth grade. The program is designed especially for students who enjoy writing and students spend a significant portion of the four hours with some sort of writing utensil in their hands (or at their fingertips.) This summer, we went with a narrative theme, encouraging our writers to bring inanimate things to life. The children loved thinking about the thoughts, conversations, and conflicts that their stuffed animals, dolls, toys, and pets could have. Most of our curriculum has students create personal narrative or realistic fiction stories, so there are not many opportunities for them to create talking turtles, or magical fairies, or heroic unicorns or mischievous elephants. All of these creatures, and many more showed up in stories last week. Each day, the five teachers had the opportunity to share what they had done, and we compiled a list of some of the successful activities. I have tried to categorize it in this post. Compliment Posters: Each child had a piece of chart paper or construction paper, and the teacher allotted time for students to write compliments to that child about his/her writing. I could see this working for individual writing units over the course of the year, as students would definitely run out of space if the poster lasted too long. The students loved reading the specific compliments, comments, and feedback from their writing community! Interview each other: Take a few minutes to come up with questions to ask each other, then a few minutes to interview, and a few minutes to share. This was a wonderful exercise for speaking and listening, but it also helped students get to know each other. Five Finger Introduction: Each finger represents something that one child will tell another child, or a group of children. (Favorite food, favorite game…) What each finger represents offers a way to differentiate the strategy, tailoring the activity to the ages and cognitive abilities of students. One syllable adjective game: “Describe a place using all one-syllable words.” The upper elementary students went on with this game by having it turn into a two-syllable word game, then a three-syllable word game and so on...We had a lot of laughs with this one. Five Senses Activity: from Show Don’t Tell- Act out certain adjectives that describe feelings, then write it. ex: sad. Salad bowl game: everyone writes as many words within a topic (people, adjectives, places, food…) on strips of paper, folds the strips, and places them into a bowl. Then, each player gets a turn to describe as many words on strips as they can in one minute. All the students at all levels loved this game, and it differentiates itself, as students write down what they know. Teachers could also differentiate by allowing more or less time for individual students. We were all inspired by Gail Carson Levine's Writing Magic, and used many of the prompts and inspirational ideas found at the end of each chapter. One of the teachers' favorites was at the end of Chapter 6: Using the point of view of a puppy or kitten, pretend you are just able to know what everything is, using all of your senses. Describe what his eyes, nose, ears, tongue, and paws tell him. Does he understand everything, or does he misunderstand some things? “List with a twist”: Write all of the words that you can think of about a specific place, emotion, etc. Then, without using any of those words, describe that same place, emotion, etc. ex: beach, sad… What incredible writing came out of this exercise. One student returned to her notebook to find the entry that she had written about the beach so that she could create a better sense of her beach setting within her story. I highly recommend this exercise for all levels of writers. Group poem: Each person writes one line, then passes the paper to the next person. Note: This activity works especially well with a title or a unifying theme. The Scholastic Story Starter is a resource that I stumbled upon when I was looking for electronic prompts. My daughter was in the program, and last night, she went back to the Story Starter and created a prompt for herself. I even heard her tell her friends about it. If you have a chance, I highly recommend checking out this resource; it offers different genres, as well as different grade levels. Our students loved it! We already have ideas brewing for next year that are based on several of the reflections from this year. If any of you have other favorite writing activities, word games, or sources of inspiration, we always welcome new ideas. Happy writing, and happy summer! As a workshop presenter, I had the opportunity to attend the keynote by Aimee Buckner on notebook strategies to support informational writing. If you have not read any of Aimee's professional books on writer's and reader's notebooks, click here to check them out on the Stenhouse site. Her most recent book is titled Nonfiction Notebooks and I have that at the top of my TBR pile now. She also contributes to the website Choice Literacy, which is a valuable resource to educators so definitely check out the website if you haven't already. Aimee is currently working on a new book on grammar in notebooks, which I am looking forward to reading. Have students bring a glue stick with them to glue in a shrinked down chart at the minilesson so they don't have to waste time copying down charts, etc. Have students do any revision and grammar lesson work in the back of their writer's notebook - turn notebook over and around so the margin is still on the correct side. Read and evaluate students' writer's notebooks every 2-3 weeks using a rubric that you share with students so they know what is expected of them as notebook writers. Escape! : The Story of the Great Houdini by Sid Fleischman is a good mentor text to use for word choice and craft. I See What You Mean by Steve Moline is a great professional book about visual literacy and how to take notes in a different format than it is in the source. For example, if the source uses words, then you can draw pictures, create a flow chart, or other visual instead of using words. This strategy of taking notes in a different format will help prevent students from copying the information directly from the source. It also helps increase their understanding of the information because they need to synthesize and internalize the information in order to put it into a different format and into their own words. Aimee had us try this strategy out using the section "Honey Jars" from Exploding Ants: Amazing Facts About How Animals Adapt by Joanne Settel. Instead of having students use boxes and bullets to rehearse for drafting, they can also use post-its so they can easily rearrange the order. They can also check off the post-its as they include the information into their draft. The National Geographic article, "Lively Lizards" by Lana Costantini, is a good mentor to use to teach introductions in informational writing. Below is the link to the article online. Slice of Life is hosted every Tuesday by the amazing writing community at twowritingteachers.wordpress.com. All are always welcome to share stories and reflections about life, or to comment on what others share. Feel free to stop over! I think that one of the most difficult aspects of falling out of the habit of regular writing is trying to figure out what to write about I try to fall back into the habit. I have not sliced for the last couple of weeks. I have the usual excuses, and I won't bore anyone with them. So now, I have a pile of potential slices. You would think that would make this post an easier one to write, but it doesn't. On the contrary, I find the pile to be overwhelming. Where do I start? How do I decide? How can I incorporate one slice into another? What if I forget about one that was really important? What if I get started on one and then don't like it? The overwhelmed feeling that I have about my writing helps me to understand how some of our young writers feel when they face that daunting blank page. Getting started or re-started really can be the hardest part. The importance of keeping a notebook of ideas and allowing time to just explore the ideas is a step in our writing workshops that sometimes is overlooked because of the pressure of mastering skills and completing pieces. Where do our instructional minutes go, and how do we prioritize what we teach and what our students really need to know and be able to do as writers? the importance of process and not product. We had all of our 43 students complete a narrative story, but the teachers agreed that the best writing had occurred when students were participating in exercises or fun prompts--when they did not have the pressure to complete a piece, but rather had the reins to explore themselves as writers. the power of conversation. We built in a lot of time for gallery walks, reflections, questions and answers, and explanations. Speaking and listening are critical skills for literacy. I'm not sure that we build in opportunities to practice these skills as explicitly and as regularly as we should. the inspiration that compliments provide. One of our teachers introduced "compliment posters" for each child, an idea that all of the other teachers implemented the next day. I loved watching the energy that students put into thinking of their compliment for their classmate's writing, and I loved watching the appreciation that our writers had for the positive feedback. Each student took their own compliment poster home at the end of the week, and I hope that it becomes a keepsake of his/her writing life. I will be reflecting, writing, and sharing more about the Summer Writing Academy over the next couple of weeks. For now, I am happy to be re-establishing my pace and my habits a slicer and as a writer.